This was a fast and simple meal. I first put a little olive oil in a skillet and turned the heat up to a medium low (4 out of 10 on the dial). Then I trimmed the ends off 6 brussels sprouts and cut them in half, placing them cut side down in the skillet. I sprinkled with a bit of kosher salt and put a lid over them and let them cook away. Meanwhile, I put a tbsp of olive oil in a sauce pan and grabbing a medium sweet onion and sliced off two slices about 1/4 inch thick and diced and tossed the onion into the oil. I grabbed one bratwurst and cut it into chunks a little less than an inch long. I added salt, pepper, cumin and garlic powder (I used this instead of fresh garlic because while looking for the cumin in the cupboard, I knocked it off the shelf and a bunch of garlic powder spilled on the counter. I quickly opted for the powder over fresh in order to not let it go to waste.) and stirred everything together. Then I diced up a tomato and tossed it in, gave a quick stir and put a lid on. Then I checked my email. After about 5 minutes or so, I checked the sprouts for tenderness. Once they were tender, I took the lid off so they could toast up a bit more. I put some water on to boil. Once it boiled, I tossed in some four cheese tortellini to cook. 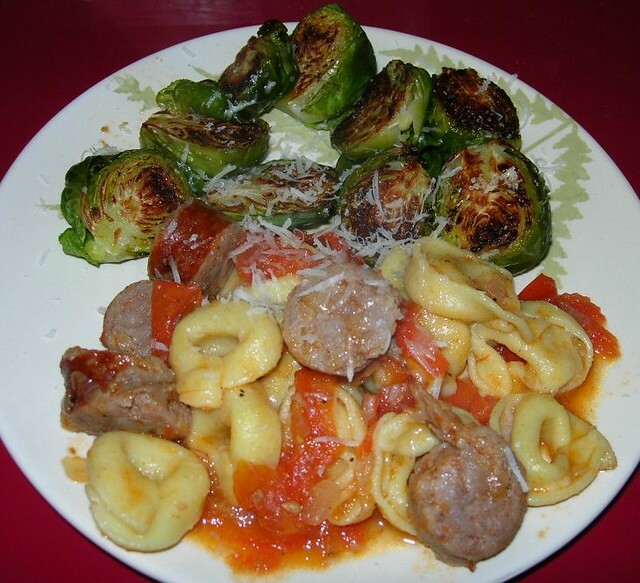 I turned the heat off the bratwurst sauce and the brussels sprouts so they were a serving temperature when I strained the tortellini. I threw the tortellini in with the sauce, gave a few quick stirs and turned it all out on a plate. I then used a spatula to gently lift the brussels sprouts from the pan and turned them onto the plate as well. I didn’t want to use a spoon and have the outer leaves come off. I shredded a bit of parmesan over the plate and enjoyed. The caramelizing on the brussels sprouts was perfect, giving it a bit of nuttiness in contrast to the rich, velvety goodness of the brussels sprout. The pasta was a nice, bright mix of sweetness and acidity from the tomatoes and hearty umami from the bratwurst and tortellini. This was super simple. First I sliced a zucchini vertically, giving myself long thin slices. I laid three down on the counter and placed one fillet of cod in the middle. I sprinkled it with salt, pepper and dill weed and then folded the strips up and around. I placed the packet with the open side down on some already heated olive oil to saute. I cooked at a low medium so that the fish did not cook too quickly and the zucchini browned nicely. I turned carefully and cooked on the other side. I then chopped the rest of the zucchini, a quarter onion and a tomato. In another pan, I sauteed the onions before adding the zucchini and tomato, seasoned with salt, pepper and garlic powder and let them cook. As soon as it was done, I put some grated parmesan cheese on top and stirred it in. I plated it with some microwave-warmed wheatberry salad, sprinkling a bit of balsamic vinegar on top. I then put the cod packet on the plate with the closed side up. 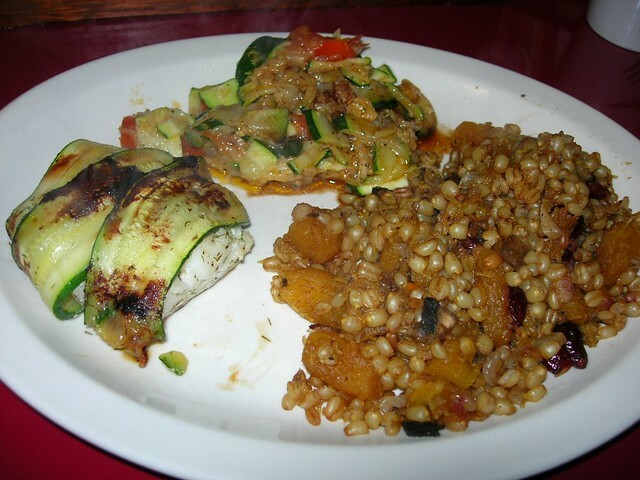 The flavors blended well with the savory wheatberry a nice contrast to the light and slightly tart zucchini/tomato hash and the subtle freshness of the cod and zucchini. The zucchini was nicely browned and added just the touch of toastiness while keeping the cod moist and perfectly tender. This was an easy recipe that came together unintentionally. I had planned to make some cod with zucchini and had tossed some onions in with olive oil and when I opened the veggie drawer to get the zucchni noticed that one tiny corner of a jalapeño pepper had begun to turn, so decided to make something with that instead. I grabbed the pepper, cut off the bad corner, diced and tossed it in with the onion. I pulled out a sweet red pepper and added that. Then I added a couple cans of black beans, salt and pepper and it all simmer. I started heating the oven to 350°. I remembered I had some lasagna noodles so I cooked up about 12 of them, boiling them in water for 8 minutes. While that was cooking, I shredded about 1 cup or so of pepper jack cheese. 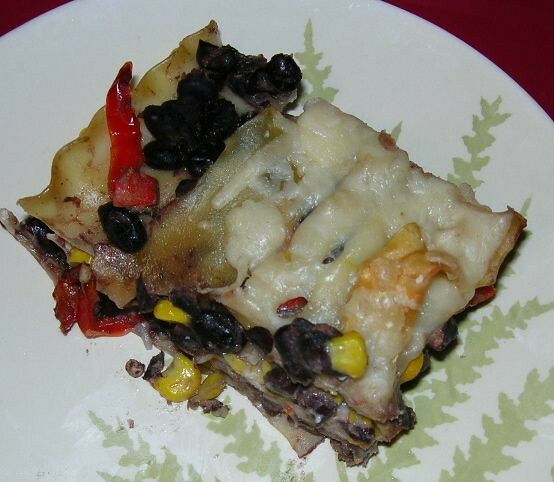 In a baking dish, I layered the lasagna noodles, then the black beans, a sprinkling of cheese, lasagna noodles, a thin layer of frozen corn with about 1/4 cup of sour cream spread over it, noodles, the remainder of the black beans and noodles again. I put it in the oven to bake at 350°. While it baked I grated some parmesan cheese, about 1/2 cup and sprinkled it on top when the lasagna was nearly done, letting it bake for a few minutes until browned. I let it rest before cutting to serve. It’s spicy, hearty and delicious. It’s drier than most lasagnas, but then I like that. As you can see, it’s rather rustic. You could chop the vegetable much finer for a more refined dish, but this was delicious as it is. This makes 8 servings which was perfect as I had company. 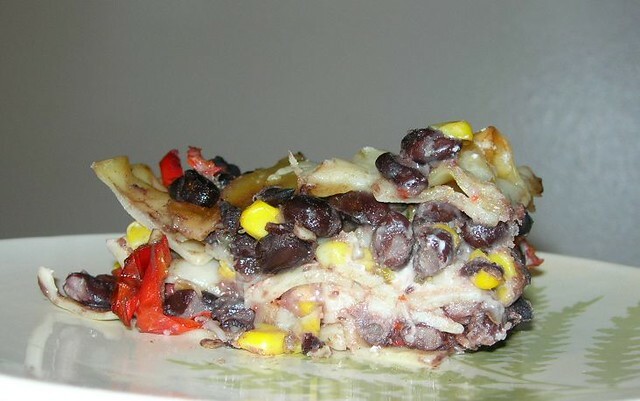 Although a relatively easy salad, it does produce a bunch of dirty dishes thanks to preparing the elements separately in order to give them different flavor profiles. 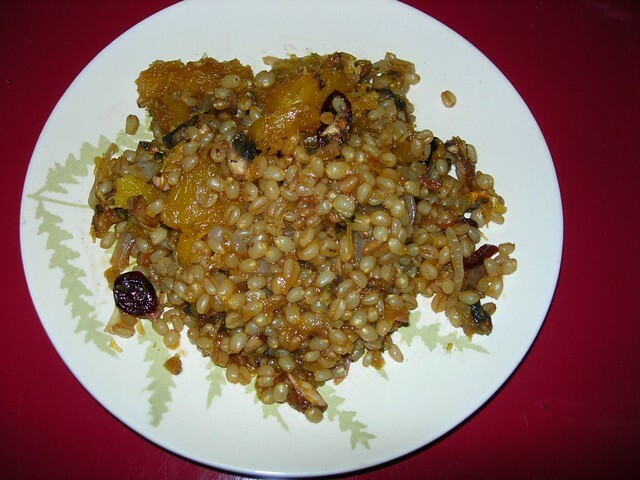 I started by putting 2 cups of wheatberries in a pot and covering it with about double its depth in water. After it came to a boil, I turned it down to a low rolling boil. It needs about an hour of cooking to be done. You want it to be a bit toothy or al dente. I cut up a small pumpkin, cleaning out the seeds and setting them aside to roast for salads. I put the pieces in a pot with water and let it boil until done. I tossed in a couple crushed cardamom pods to flavor the pumpkin. After it was done, I rinsed with cold water so I could easily remove the skin and chop into 1/2 inch pieces. Meanwhile, in a skillet, I put a TBSP of olive oil on to heat. I added about 1 tbsp dried sage, 1/2 sweet onion diced, salt and pepper. After the onions were softened, but not caramelized, I added 8 diced mushrooms and sauteed. By then the wheatberries were done and I strained them. I then added the cardamom flavored pumpkin and the sage flavored mushrooms. I then tossed in a handful of dried cranberries. To dress, I mixed up a bit of mustard, a dash of sriracha and some baldamic vinegar. A bit of salt and pepper to taste and served. It’s a warm salad, though it tastes good cold as well. The cardamom and sage flavors come as separate note, underscored by the tang from dried cranberries and balsamic – and a bit of heat with mustard and sriracha. It was delicious and a great addition to Christmas dinner. 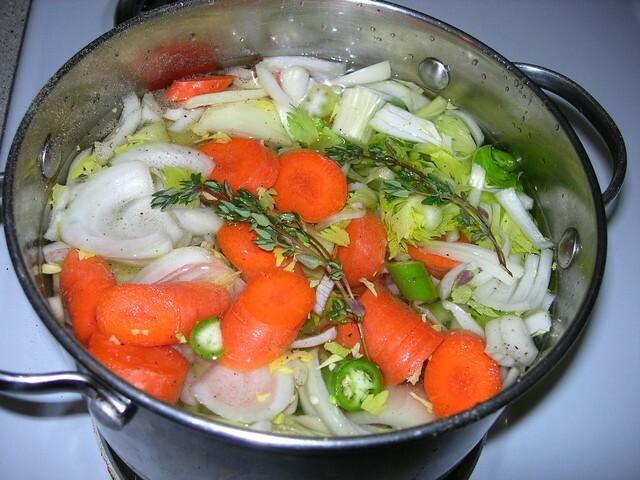 This is a quick and easy soup recipe that has lots of rich, multi-layered flavors. It takes a little over 30 minutes from start to finish and tastes like it took all day. I had picked up some kale to make a salad, but didn’t get to it quickly and the kale got a bit wilty, so I knew I would have to cook it. 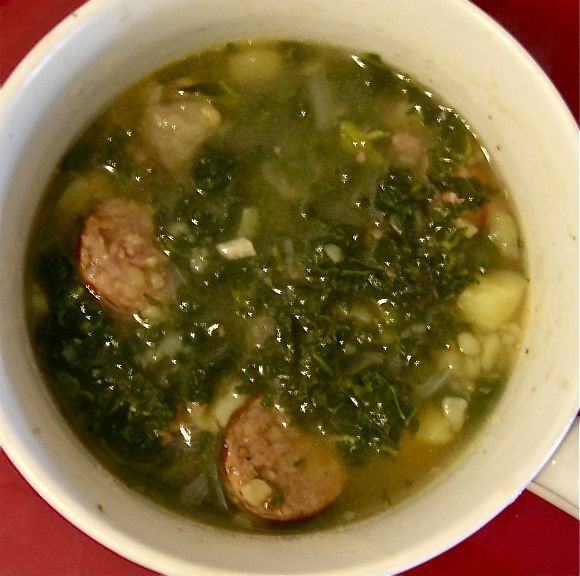 I thought about making a kale hash or something and then got a brainwave to try and make a caldo verde, a soup I had when I was in Spain that was made with potatoes, kale and sausage. I didn’t have linguica or chorizo and probably should have compensated by adding a bit more spice, but to be honest, this mild version is truly delicious and it didn’t need the spicier sausage. So, to begin, mince 3 cloves of garlic and dice 1 onion. Saute in olive oil with one bay leaf, salt and pepper. Cooking just until softened, but without any caramelizing. Add 2 quarts of water and 4 cups of diced new potatoes (I used fingerlings) and let boil for 20 minutes. Meanwhile, in another pan, cook 2 sausages, drain and slice. I used bratwurst because that is what I had. While the sausage is cooking, trim the stems from a pound of kale, rinse the kale, squeezing it dry and chop up fine. By now the potatoes should be softened so you can take a masher and mash them up in the soup pot. If you’re ambitious, you can pull them out and puree them, but I didn’t bother. Once they are mashed, I added the sausage and the kale, put the lid on and let cook another 5 to 10 minutes. I pulled out the bay leaf and let cool a bit and it was done. It has a rich, earthy heartiness with the subtle spiciness of the bratwurst. I could have added a tiny bit of jalapeño with the onion and garlic, but it’s delicious without as well. A linguica or chorizo would be a bit spicier and would definitely not need more spice. I think it will be even better tomorrow. This is not your usual celery soup. 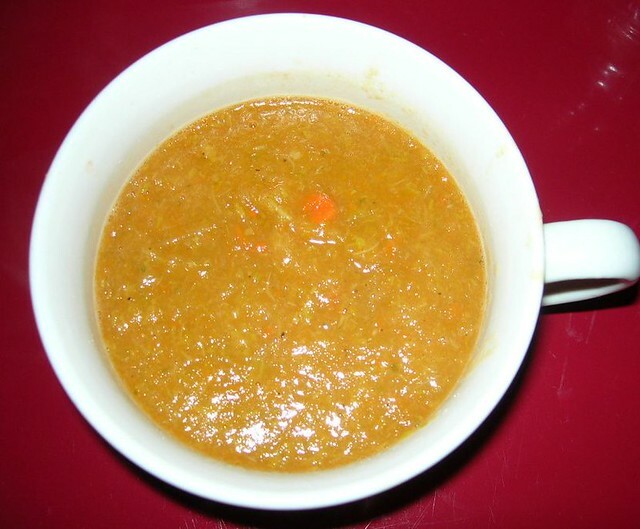 It’s light, lean and spicy with a rich earthiness that is in every way the opposite of the Cream of Celery soups that were used to add a vegetable to church potluck casseroles. It’s also quite possibly the easiest soup in the history of soups. Quite simply, you take a head of celery and chop it into big chunks and toss it in a a pot with a chopped up carrot, half an onion, a couple twigs of thyme and a serrano chili. If you want it milder, you can carefully clean the chili. I went for heat and just chopped it up a bit and left the seeds in. I tossed on some salt and pepper and put it on to cook. To show you how ridiculously simple my chopping and prep was, here’s a snap of the pot just before I turned on the heat. Yeah, I spent two minutes chopping. So then I let it come to a boil and then turned it down to a high simmer. I checked it a couple of times by trying to smoosh a piece of vegetable with my spoon. When it cooked enough that my spoon could squash (but not disintegrate) the veggies, I took it off the stove to cool down enough to puree. I use a Magic Bullet and if it’s too hot, there’s no opening it back up without help. Once it was a bit cooler, I pureed it and sat down to a delicious soup. I ate it plain since I don’t like crackers in my soup, but some chopped pecans or almonds might have been a nice touch. There’s a earthy, umami flavor from the celery and a nice spicy heat from the chili, the carrot adds a mild touch of sweetness to balance the flavors. It’s a filling, hearty soup though with no oil, no cream and no meat, it’s almost no calories. This makes 8 servings, but since it is not a cream soup it will keep for several days in the fridge.